The everyday life of a born again Christian walking through the Kingdom of God. A journey to.. discover the Lord and all of His glory. Won't you come and walk with me too? Blog Personal que habla sobre cuidado facial y otros temas. 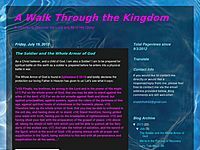 Christian inspirational blog that uses God's Word and biblical principles to encourage.. believers. Topics range from general & holiday posts, to inspirational, to guest authors and.. bloggers. Posts always include Scripture and Christian themes. A devotional blog by David Good about the pursuit of living life the way God intended us to live. 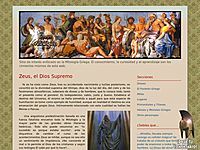 Sitio de interés enfocado en la Mitología Griega. El conocimiento, la curiosidad y el aprendizaje.. son los cimientos mismos de esta web. Encouragement from the Bible about God's love and positive designs for your life. Each post.. takes a verse of scripture and offers a meditation of comfort and hope.